Don’t Sit on Tumtum with Your Bum Bum! – The Bookshelf of Emily J. Okay, that’s some really bad potty humor, but it made us laugh. 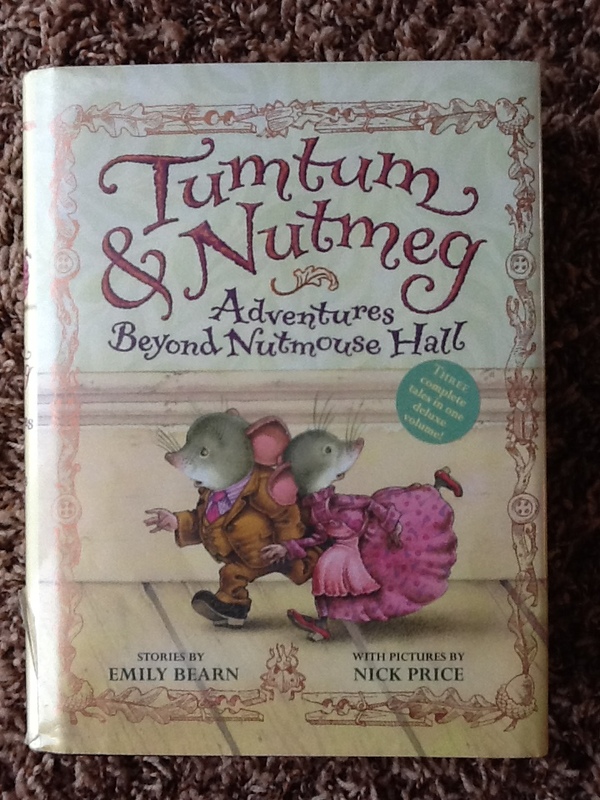 My daughter and I had been reading Tumtum and Nutmeg: Adventures Beyond Nutmouse Hall (2008), a lovely adventure story about domesticated (and quite civilized) mice. We left the book on a chair in our living room, and when my husband sat on it and didn’t realize that he was sitting on it, we said, “Don’t sit on Tumtum with your bum bum!” to tease him. As to the book, it is quite charming. It is a children’s book published by British author Emily Bearn. Despite many punctuation problems and what I would consider to be grammatical errors (darn my copyediting eye), Olivia and I enjoyed reading it together. Tumtum is the husband mouse, who wears a tweed suit, and Nutmeg is his lovely wife, who enjoys baking and keeping up their large home called Nutmouse Hall. This home is centuries old (reminiscent of old English country estates) and lies inside Rose Cottage, a small ramshackle home of Mr. Mildew and his two children. The Mildew home is neglected and rundown because, of course, a single father can’t be expected to do any housework. He’s too busy inventing things! The children are somewhat neglected, so Nutmeg takes it upon herself (and enlists Tumtum) to fix things up for the children. The pitiful state of the home is what actually allows Nutmouse Hall not to be discovered. It is a spacious manor in a forgotten broom closet in the kitchen. Nobody knows the broom closet is there, because it was long ago covered up by a large chest/armoire. Of course, every story needs conflict and a good villain. This is where Aunt Ivy comes in. She comes to visit, discovers the mice (dressed in clothing!) prancing about the house, and vows to destroy them. The mice are caught after leaving the children’s room (in the attic, no less) where they had been darning socks, fixing the radiator, and tidying up the dollhouse. And so warfare ensues. Aunt Ivy plots to kill them with toxic hairspray and the mice must give up their efforts to help the children in order to stay safe. I won’t give away the entire plot, although I doubt any of you will end up reading this book, but Nutmeg must enlist the help of General Marchmouse in order to save themselves and Nutmouse Hall. The book really is a stupid story. But I loved it! I did. I have always had an affinity for the miniature. There’s something so appealing about a smaller world. Some of my favorite books growing up were The Borrowers and The Littles. I even wrote my own story about a miniature person named Sarah Small. That manuscript mysteriously disappeared, otherwise I would still have it. At the time, I blamed my step-father for throwing it away, and I still do. Forgive and forget? No way! That could’ve been a bestselling children’s book. And as few as five years ago, I built my own dollhouse. It was something I had always wanted to do. I’d spent years pining for one, begging for a kit, and hoping that I’d be able to do it. Well, I finally did it. I bought a kit for the simplest dollhouse and I spent each night after my young daughter went to bed pounding nails and gluing window frames. One of the windows turned out badly, but after that first attempt, I had it figured out, and the rest went in correctly. It didn’t look great. It wasn’t perfect. But I had finally done it. Will I do it again? No way! In fact, I recently gave that dollhouse to the thrift store. It was too big, in the way, and starting to lose some of the parts. I said my goodbyes and let go. I guess you could say it was cathartic. I built it, I held onto it, and then I was able to move on. It’s not my talent nor will it become a big hobby of mine. But I’m glad I tried it. My overall impression of Tumtum and Nutmeg is that it is a fun and heartwarming book. But as I thought logically about it, mice are pretty creepy. I wouldn’t want them in my house, even if they were helping my poor, cold, neglected children. So while reading about them is one thing, having this story turn real would be quite disgusting, especially when they attack Aunt Ivy. I’ll have to look for a picture of it. I’m not sure I have one! Loved this post – ecxept I’m sad to hear about the lost story of Sarah Small. I’ll have to read Tumtum and Nutmeg with Josie someday. Ha! The truth is that I probably left it on the counter and somebody threw it away. Oh well. Do read it with Josie when she’s older. It is a fun one. There’s something about stupid stories for children that’s charming, isn’t it? I love children’s books! I have been collecting the ones I loved the most when i was a kid. The illustrations are a big part of that for me. Mice, too, are special little characters for kids. Hello Beatrix Potter! Actually, a lot of children’s books have mice characters. I wonder why that is. I once wrote a story called “Gus and Gertrude’s Christmas” about two mice who build a walnut car with a trailer so they could go get a Christmas tree to put inside their house, which was also a christmas-y fir tree. (these were forest mice apparently) It was super cute with illustrations and I was proud of it back then. I was very young. I’ve seen it since, and it’s not so great to my adult eyes. I’m surprised my grandma kept it. I should’ve just remembered it the way I did as a child. I hope your Sarah Small stays big in your mind as the story that got away. Thanks for the fun post. This looks so cute, I love mice. I actually made a dolls house with toy mice to live in it! It was for my niece… ahem. I’ll have to get a copy of this. LOL! That is absolutely what needs to be done when she’s gone. I don’t know why, but I have always had a problem with children’s books that make mice into heros. Mice chew holes in the eaves, walls, boxes, sheets, and blankets. They poop and pee in the house and destroy food stores. Why are they the most common animal made into a hero? And what on earth is the justification of making movies about them helping in the kitchen? When overcrowded they are viscious with each other and have even been known to bite young children in apartment complexes. Mice are not heros. You’ve made the book sound sweet and intriguing – yet you bring it back to reality which is a good thing. I believe that part of the “save the planet” but “kill the babies through abortion” comes from children’s stories and movies that give attributes to animals without clearly showing how they fit into the circle of life – everything has a purpose in nature and everything dies – not sure you were going there with your review, but your review took me there!